The 3rd Annual THF Online Auction went live on Tuesday, February 6th, the same day that Tyler Hamilton participated in his first race in Europe for the 2007 Season. 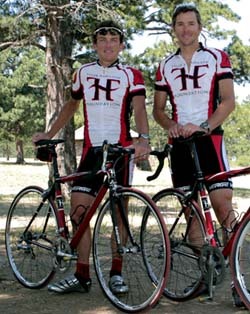 The THF Online Auction raises critical funds to help support the mission of the Tyler Hamilton Foundation: To promote health and personal empowerment through cycling. The online auction format powered by Cmarket is user friendly and provides many creative avenues for bidders to watch items and compete for the highest bid. Over the course of the last two years, the THF Online Auction nets $25,000 to help fund the foundation. Individuals are encouraged to bid on items, and to consider donating items as well. It is as fun as EBay. To view auction go to www.thfgala.cmarket.com.